Many things have happened these past few days after Filipino pride Manny "Pacman" Pacquiao lost to Marquez. Until today, I can't believe that some of fellow Filipinos are showing disgust and degrading words towards Pacquiao. The feeling of disappointment, I think is acceptable and okay but those damaging and lowering choice of words shouldn't be used in characterizing Pacquiao. Of course many Filipinos are still proud of him and we should all feel the same way. As I posted on my twitter account, let's turn up the love and turn down the hate. Success is not measured by money and triumphs but also the way on how to respond, handle and accept defeat and Pacman showed that gracefully. He even smiled after the bout, where can you see such kind of attitude? Everybody is entitled to their own opinion and we should respect that but those engative words coming from fellow Filipinos is kind of sad. I saw a photo on my Facebook timeline saying: "Pacquiao raise our flags during his victories, it is now our time to raise him up!" True, very meaningful statement. Instead of posting those lambasting words, why can't we just be proud and remember all those accomplishments. It was like a big white circle with a dot on the middle on which we can only see the dot without minding the totality of the area. It is okay to lose; the most important thing is that he still stood up and accepted the result of the match. We should do all that, accept it and be still proud of him. My take on this Justin Bieber opinion is that let him say those words. It is his opinion and he is entitled to it. His comments will not degrade the humanity of Pacman. Let's put it this way, when Pacman won on some of his fights, didn't we post some pictures of those boxers that he fought with? We even put some humiliating words towards those men and displayed their defeat as a funny thing. But did we hear any negative outburst of emotions from the Mexicans? Maybe they also had their opinions and for sure during those times we are using the statement "everybody is entitled to their own opinion". Now, let them use and apply that statement, nobody is perfect. Let's just respect them. What's the most important thing is to support Manny and look into those things that he did for our country. On the latest news that I have read, he even donated 10 million pesos to the victims of typhoon Pablo, now can you do that? Philippines has been tagged as "the world's most emotional nation" and we have proved this many times. We are so expressive with our emotions. We are so sensitive in every situation that we are experiencing. I'm not saying it's a bad trait but we should still be careful in our actions. 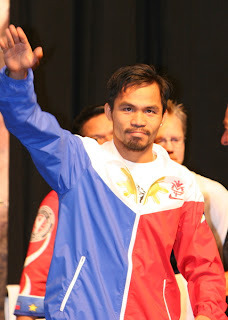 Let's just celebrate the victories and the honor that Manny brought to our country.